Live View shooting mode is essentially what it says on the tin – you’re seeing what the camera’s lens is seeing, and what the sensor is recording, but on the LCD rather than through the optical viewfinder. Live View is activated by either a switch or an ‘Lv’ button on the camera body. It enables you to view and compose the shot on the LCD screen, enabling you to shoot with the camera at an unusual angle or away from your body. Plus, it enables you to check the effects of settings such as white balance, colour processing and exposure which you can’t see in the viewfinder. And it’s terrific for precision focusing, as it enables you to check all areas of the subject for sharpness by using the magnifying function on the LCD, then correct any dodgy areas by manual focusing adjustments. DSLR phase-detection AF sensors are blocked whenever a camera raises its reflex mirror to expose the imaging sensor, and this is what happens in Live View’s handheld mode. Since the imaging sensor constantly streams data for the LCD display during Live View, the mirror must be continuously held up while Live View is in use. When you press the shutter there’s a brief interruption to the Live View display as the camera drops the mirror, focuses and then quickly flips the mirror back up to capture a shot, after which Live View resumes. While this is fine for static scenes like landscapes, still lives and macros, it can make it tricky to get a good shot if your subject is moving or requires precise timing. Nikon DSLRs with a Tripod Live View mode which uses contrast-detect autofocus driven from the imaging sensor. Instead of flipping the mirror up and then back down momentarily to autofocus, the camera keeps the mirror raised continuously, reads data off the image sensor and evaluates how abruptly light-to-dark or dark-to-light transitions happen on the image plane, allowing focus without interrupting the Live View display. Tripod mode also has the added benefit of allowing the exact positioning of the AF point anywhere within the frame. 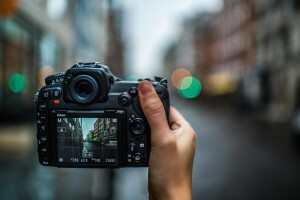 Some DSLRs have Live View accessible with full-time-servo AF (to track the subject continuously) and Face-Priority AF (which locks onto faces) without requiring you to press the shutter button. Live View can also be a good choice for portraits, as it enables you to make eye contact with your subject, instead of covering your face with the camera as is the case when you look through the viewfinder. • In Movie Live View mode, if the shutter button is pressed the video recording will end and a still image will be captured. • Quiet Live View mode minimises noise by keeping the mirror up when pressing the shutter button. • In Silent Shutter Release function the mirror remains up and the shutter open. • As it’s more difficult to hold a camera steady when composing on the LCD screen, Live View is best used with the camera on a tripod.